Orbital ATK’s Minotaur IV rocket shot up into the night skies over Florida’s Space Coast in the early hours on Saturday, carrying out its debut launch from Cape Canaveral to dispatch the ORS-5 Space Situational Awareness Satellite into a perfect equator-hugging orbit to keep tabs on activity in prime orbital real estate in the Geostationary Belt where the world’s communications, weather and intelligence-gathering satellites roam. 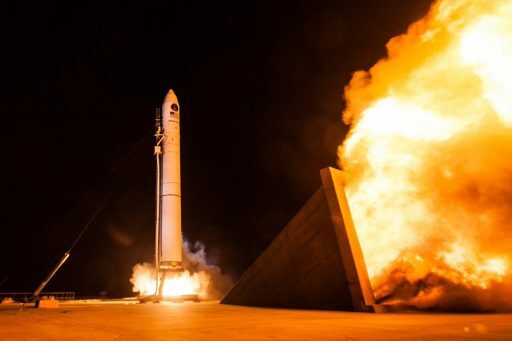 Powered by three leftover Peacekeeper missile stages, Minotaur IV did not hang around after firing off from Space Launch Complex 46 at Cape Canaveral Air Force Station at 2:04 a.m. local time, 6:04 UTC – marking that pad’s first use since 1999. The three-decade old Peacekeeper stages propelled Minotaur IV onto a sub-orbital arc and a pair of commercial Orion 38 stages built by Orbital ATK fired in methodical fashion to first put the stack into orbit, then release three CubeSats hitching a ride on the vehicle and firing the second Orion 38 motor to bend the orbital trajectory and transition into a zero-inclination orbit, 600 Kilometers in altitude. 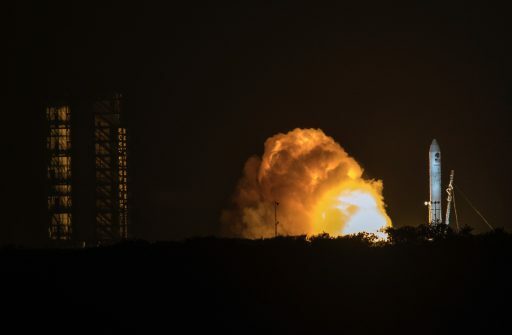 The 113-Kilogram SensorSat spacecraft was pushed off by loaded springs 28.5 minutes after liftoff into a nominal orbit, set to begin a three-year gap-filler mission providing vital space situational awareness data to the U.S. military. 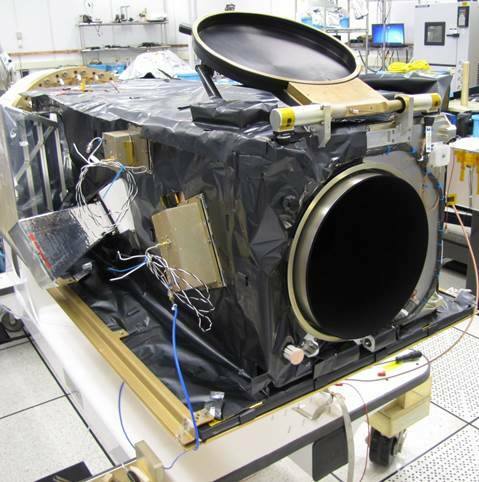 Although the satellite is small enough to fit into the trunk of a typical car, it will become a critical operational tool to keep track of activity in Geostationary Orbit by scanning each resident space object inhabiting GEO more than a dozen times a day to catalog potentially dangerous space junk and purposeful movement of satellites that may represent a threat to U.S. or allied space assets. The ORS-5 mission is the latest in a series of low-cost missions by the U.S. military’s Operationally Responsive Space Office that employ a large amount of commercial-off-the-shelf technology combined with purpose-built sensors to test out new satellite technology, operate experimental imaging and communications satellites and demonstrate new launch vehicles. 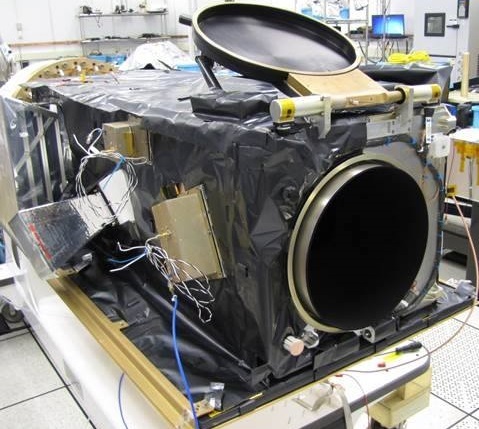 The primary objective of SensorSat is closing an imminent Space Situational Awareness (SSA) data gap as the Space Based Space Surveillance SBSS-1 satellite reaches the end of its planned seven-year service life later this year. The $823 million SBSS mission uses a one-metric ton satellite in a Sun-Synchronous Orbit, hosting a gimbaled imaging platform to scan a sector of the GEO Belt every time the satellite’s polar orbit intersects the equatorial plane – allowing it to examine every spacecraft in GEO at least once per day. Populated GEO Regime – Image: Analytical Graphics, Inc.
SensorSat comes with a more affordable price tag of $87.5 million and establishes a permanent stakeout post in an equatorial orbit 600 Kilometers in altitude, circling some 35,000 Kilometers directly below the GEO Belt, allowing for continuous scanning to track every resident GEO object once every 104 minutes. 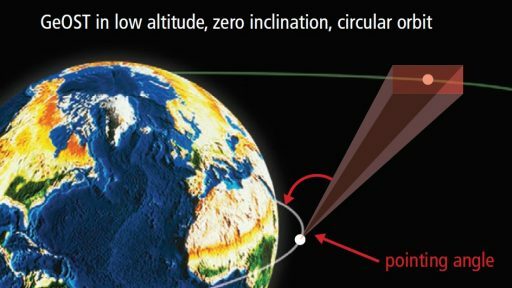 Geostationary Orbit is one of the most critical orbital regimes, representing a narrow band 35,800 Kilometers over Earth’s equator where a satellite’s orbital velocity matches that of Earth’s rotation – permitting spacecraft to be ‘parked’ in a fixed position relative to the ground in order to beam communications to the same area on Earth, collect weather data from a constant viewing sector or vacuum up communications intelligence from a location of interest. This makes Geostationary Orbit a particularly important orbital regime for government and commercial use. 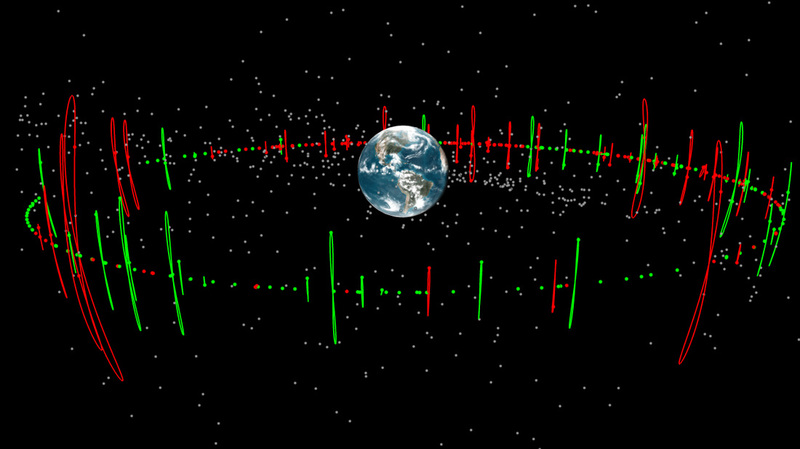 The Geostationary Belt is currently populated by 441 satellites in various states of activity and other members of the GEO population include zombie satellites that have become uncontrollable from the ground as well as a large number of smaller and larger debris. 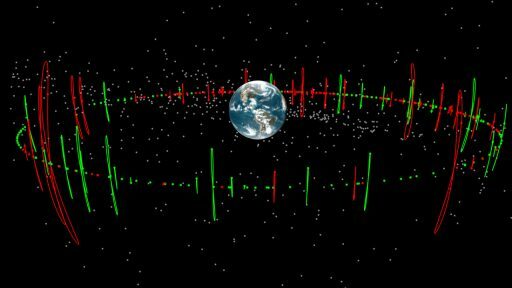 Objects in other orbits also intersect the GEO Belt and require close monitoring to ensure a collision-free passage, making Space Situational Awareness a priority when it comes to protecting a nation’s prime space assets. Scanning the entire GEO Belt 15 times per day, SensorSat will feed critical tracking data to military officials to identify threats arising from debris and purposeful action by foreign entities. Data delivered by SensorSat will be used to task SBSS-1 to obtain better data while the satellite remains in operation and it will also inform decisions on where to direct the U.S. military’s patrol satellites roaming near GEO. 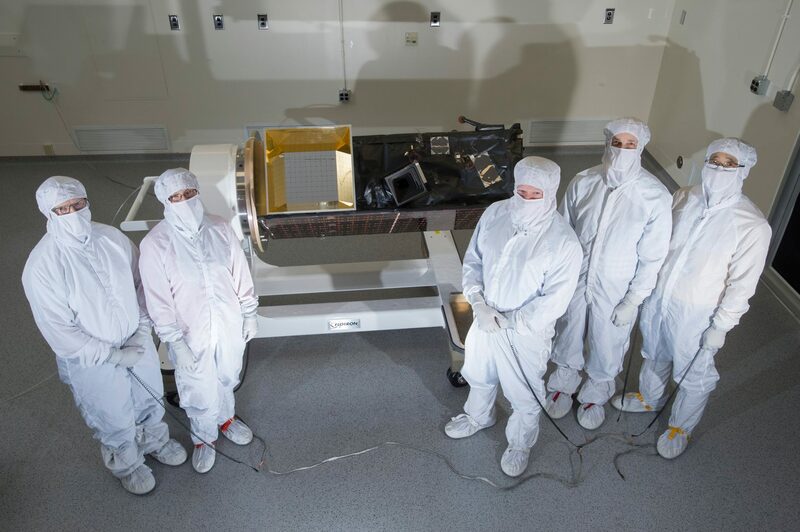 Launched in 2014 and 16, the U.S. operates a two pairs of satellites under the Geosynchronous Space Situational Awareness Program that can provide close-up characterization of resident objects in GEO to assess their identity and intent. Built by MIT’s Lincoln Lab, the SensorSat satellite packs quite a punch despite its low cost – setting out to become an enabler for future responsive & taskable sensors that can be deployed on cost-effective small satellite platforms. The mission’s secret lies within a novel observation geometry revolving around the ‘Magic Angle’ – pointing SensorSat’s telescopic imager to a portion of the GEO Belt well ahead of its own position so that the sensor’s velocity perpendicular to its line of sight exactly matches the target satellite velocity perpendicular to the vector joining the two. This imaging geometry allows objects in GEO to appear momentarily motionless which, when combined with the proper exposure time and Time Delay Integration scheme on the detector, allows the instrument to pick up very faint (small) objects through their optical signature. Finesse is required when setting up the magic angle as SensorSat will have to adjust its orientation ever so slightly as its orbital altitude decreases over the course of the mission due to drag. 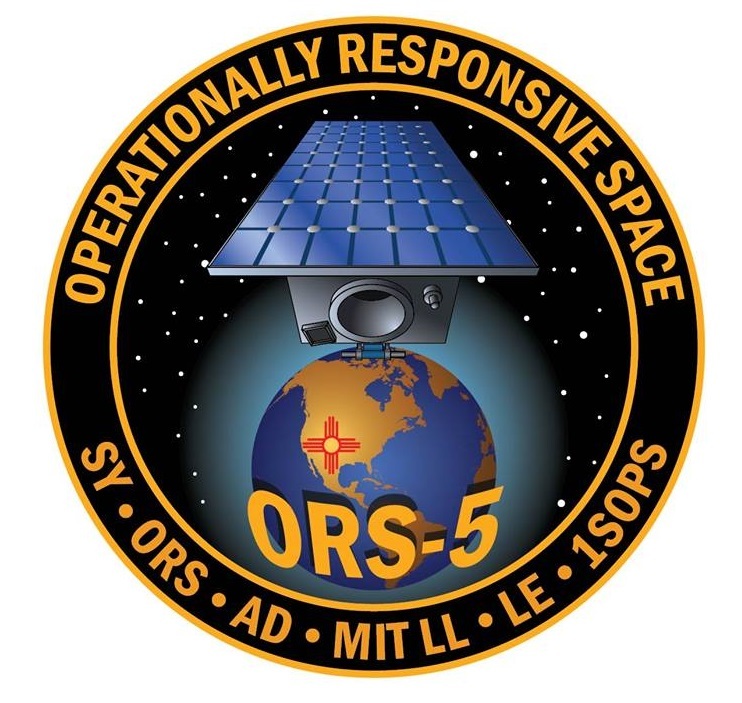 The cost for the ORS-5 mission is broken down to $49 million for the satellite, $27.2M for the Minotaur IV launch service and $11.3 million for the ground system that is responsible for converting optical tracks collected by SensorSat into precise & constantly updated tracking elements for the large population of GEO objects. The mission’s brief commissioning phase will be run from Kirtland Air Force Base before moving over to Schriever AFB for regular mission operations. Called upon for the launch of ORS-5 was a tailor-made version of Orbital ATK’s Minotaur IV rocket, employing the standard stack of three surplus solid-fueled Peacekeeper stages and a commercial Orion 38 motor as fourth stage plus an additional Orion 38 added to the stack as fifth stage to accomplish the equatorial injection. 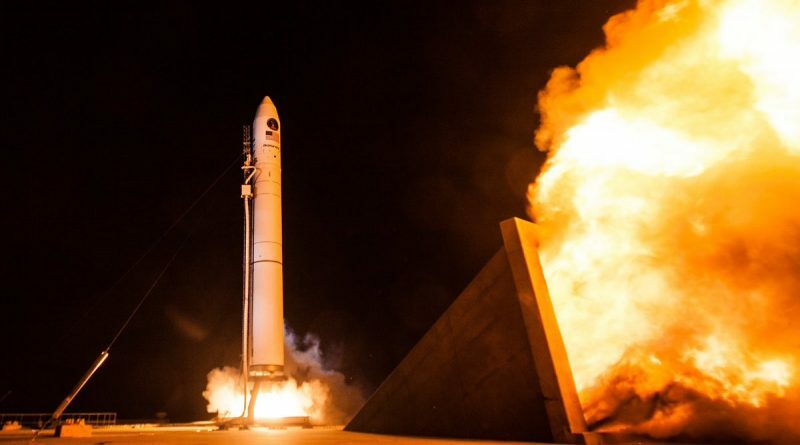 The requirement for an equator-hugging orbit also drove the decision to move the launch to Cape Canaveral as the closest U.S. launch site to the equator after evaluations had also been made for launching from the Guiana Space Center in South America. The five-stage, 87-metric-ton Minotaur IV completed stacking starting in early August and went through a Mission Dress Rehearsal on Monday to be ready for countdown operations into Friday night. 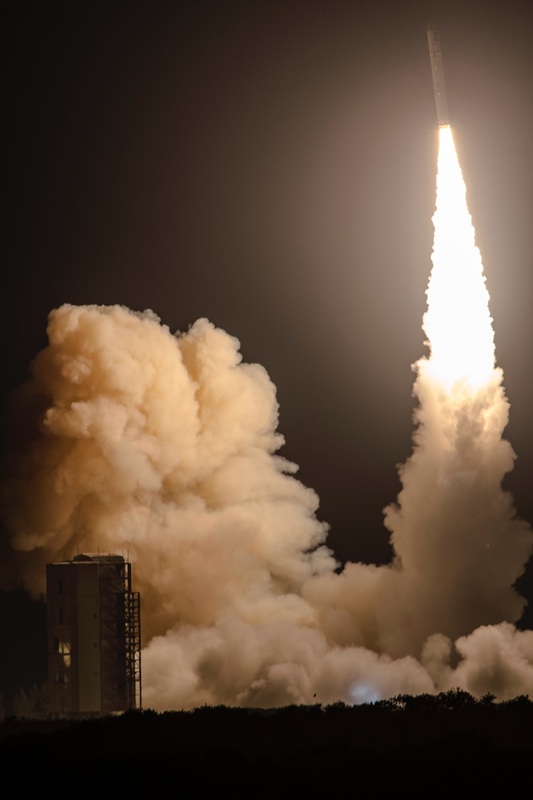 A lengthy hold-up to launch preparations was caused by a series of thunderstorm cells moving north over the Cape area, requiring teams to hold off on retracting the service gantry at SLC-46 and pushing liftoff deep into the night’s 3-hour & 45-minute window. Countdown operations ran like clockwork after the weather delay and teams completed arming of the Minotaur IV followed by a last set of electrical checks, verifications of the Flight Termination System and navigation system setup, clearing the way for the launcher to take over control at the T-2-minute mark. The 24-meter tall Minotaur IV leapt off its SLC-46 launch pad at precisely 6:04:00.224 UTC, departing the Space Coast in a hurry with a total thrust of 227-metric ton force and an initial thrust to weight ratio in excess of 2.6. Given its ICBM heritage, the vehicle did not hang around and raced into partly cloudy skies, pushing through the sound barrier and hitting Maximum Dynamic Pressure just 36 seconds after taking off and starting a trek to the east-south-east toward the equator. 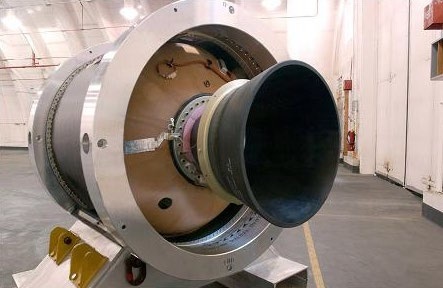 The SR-118 first stage burned through 45.4 metric tons of propellant in just 56.5 seconds, lifting the vehicle to an altitude of over 25 Kilometers and boosting its speed to 1.3 Kilometers per second. Stage 2, designated SR-119, took over as soon as thrust began tailing off on the first stage, generating a thrust of 125 metric-ton-force for a burn of 57.6 seconds to raise the vehicle’s velocity to 3.9 Kilometers per second, consuming 25 metric tons of packed propellant. The second and third stage parted ways eleven seconds after Stage 2 burnout with the SR-120 taking over powered flight for the next 72.6 seconds, generating some 29,500 Kilogram-force of thrust to push the stack to a speed of 6.9km/s and place it onto a sub-orbital arc. Passing 130 Kilometers in altitude, Minotaur IV dropped its fairing two minutes and 24 seconds into the flight to shed no-longer-needed weight on its way toward orbit. The third stage exhausted its propellant supply of 7,100 Kilograms three minutes and 17 seconds into the flight, marking the start of a ten-and-a-half-minute passive flight phase to allow the vehicle to climb from 194 to 573 Kilometers in altitude so that the fourth stage could inject the stack into a preliminary Parking Orbit. The upper composite of the Minotaur IV in use on Saturday was specifically tailored for this mission, featuring the standard Minotaur IV Orion 38 / Guidance and Control Assembly module as fourth stage and the Orion 38 / Insertion Stage Assembly borrowed from the Minotaur I as a fifth stage, complete with its own avionics and attitude control system. Orion 38 itself is 1.34 meters long and 0.97m in diameter, packed with 770 Kilograms of propellant to deliver an average thrust of 3,335-Kilogram force over a 67-second burn. Orion 38/GCA fired up 13 minutes and 51 seconds into the flight and successfully injected the stack into a parking orbit of around 400 by 600 Kilometers, inclined 24.5 degrees. Two minutes after burnout of the fourth stage, Minotaur IV began the release of three CubeSats that hitched a ride as secondary payloads, arranged through Seattle-based launch broker Spaceflight Industries. 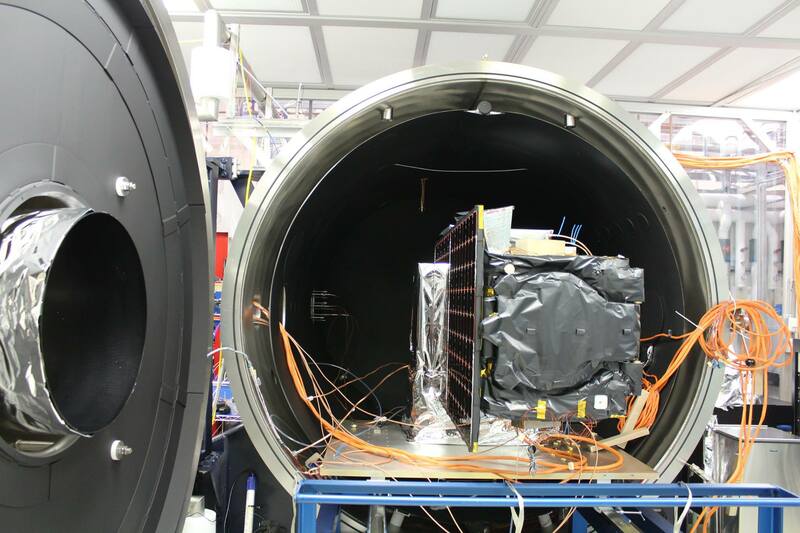 Two of the CubeSats were 1.5U satellites developed at Los Alamos National Laboratory (likely belonging to LANL’s Prometheus project demonstrating a CubeSat-based communications infrastructure) and a 3U CubeSat from the Defence Advanced Research Projects Agency, DARPA. The fourth stage dropped away just after passing the T+25-minute mark and the Orion 38/ISA fired up at T+25 minutes and 20 seconds to accomplish the most significant Low Earth Orbit plane change ever carried out – reducing the orbital inclination from 24.5 to zero degrees and also increasing the perigee altitude to 600 Kilometers to reach a circular orbit. Propulsive flight went by the book and concluded at T+26 minutes and 28 seconds, setting up for two minutes of coasting and thrust tail off before SensorSat was planned to be sent on its way. Orbital parameters based on Minotaur’s navigation system were reported as 599 by 604 Kilometers, 0.02° – indicating the vehicle hit its orbital mark perfectly. Saturday’s launch marked the 26th flight of the Minotaur series, the sixth of the Minotaur IV family and the first from Cape Canaveral. Orbital ATK has two launches lined up before the end of the year, targeting October for the launch of a commercial Minotaur-C (formerly named Taurus) with six SkySat Earth Imaging Satellites and November for the company’s next Antares mission with the Cygnus OA-8 resupply craft headed to the International Space Station. 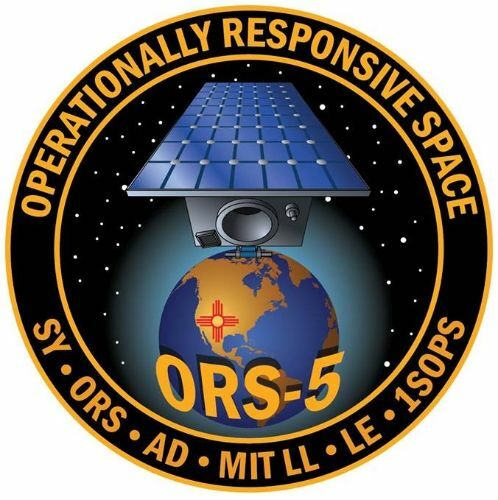 Copyright © 2019 ORS-5 | Spaceflight101. All rights reserved.